co-workers and friends, Helen Lee, who met a couple, John & Cindy Mahoney, the three of them conceived the idea on a vacation, While sharing a drink, they talked about the joys of traveling with little ones and the backpacks full of things that they would pack to make airplane travel just a little more enjoyable for everyone! And out of that conversation, the AllPakt was born! So what exactly is the AllPakt? 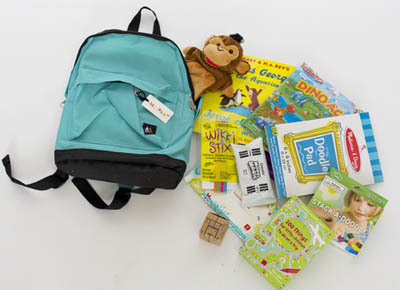 Well, quite simply it is a backpack full of toys and activities for preschool aged children to keep them busy! So what did they grab first? Mattias, my 4 year old, went straight for the Cubebot, a robot made of wood and elastic. A superhero addict, Mattias was happy to pose and then fly his robot around his seat and crash land it back on the tray table! Markus, my two year old, went right for the dinosaur magnetic board and was happy to stick and unstick the dinosaurs and eggs all over the prehistoric play scene. There was also lots of room for me to pack some snacks for the kids My staples are things like fishy crackers, granola bars, apples (for domestic flights only), or fruit snacks. I was even able to fit their “lovies” in the bag. For Markus it is a small blankey and for Mattias it is a bunny and a small blankey! I clipped a empty reusable water bottle for filling once past security, on to the handle of the backpack and we were set for our flight! 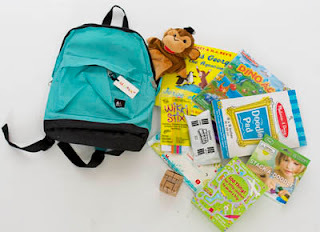 I probably could have fit a spare change of clothes (always a good idea when flying with kids) if I had not put both kids snacks and lovies in the same backpack! backpack. 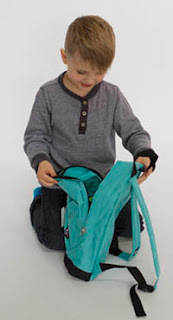 The idea is for them to carry it themselves, so if it is too heavy, you will be the one with it on your back! The AllPakt is 1.5 kg when packed (3 lb. 5 oz.) with the included contents. But if you do end up having to carry it yourself, do yourself a favor and attach a carabineer clip to one of the straps and you can easily hook it to your bag or case in seconds! Now that we are home, this adorable backpack will live in our car for road trips and we can refill it with snacks and new treasures on our next vacation!